This east coast destination full of history and colonial charm is the largest city in the state by sheer area, and the 11th most spread out city in the nation. We provide a first rate opportunity for you to find an emergency dentist in Suffolk VA , anyone in your family can have a drastically altered vacation or stay when dealing with severe tooth pain. When you call our 24 hour, 7 day a week hotline, you could be sitting in a chair in the fastest amount of time possible! Our network of dentists have been carefully researched to provide only the best emergency service level, and Suffolk VA is in that network! We want you to be able to obtain relief in the dental realm right away, and to be pain free for the rest of your time spent in this city with plenty of storybook history to experience. 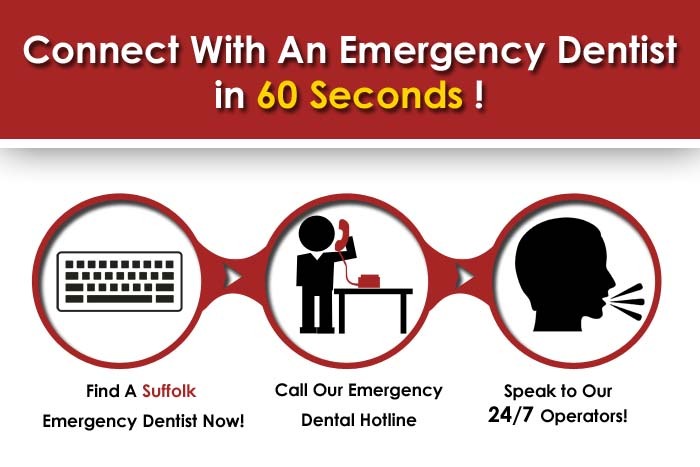 If you cannot reach any of these dentists immediately, don’t hesitate to call our hotline that acts as a referral service for a Suffolk emergency dentist that can figure out why you are in such pain, and what to do about it. Known for being a producer of peanuts and the location of the Planters’ factory, Suffolk is also a favorite among cycling enthusiasts, for it’s swamp trails and 4+ miles of rocky off road challenges. These Suffolks dentists are vetted by Emergency Dentists USA, and will be able to offer you the quickest relief possible if that dreaded dull ache rears it’s fearful head on you in the middle of the night, and makes you need a walk in dentist. Description: By using this referral service, you can tap into the best network to end your throbbing pain if you suddenly need a dentist open on Saturday or your busy schedule does not allow you to see one during the normal business hours some provide. Our resources are here for you if your children suddenly have an accident, cracked tooth, or problem with incoming wisdom discomfort. Knowing we are here for you will make you at ease, instead of having you skim through yellow pages listings as the pain gets worse. Description:The best thing about this clinic is that they realize most people don’t have a lot of free time to take off to see the dentist, and that you may have to come in on a weekend or evening to get seen. Dr. Adam Hogan, D.D.S., studied at the University Of Michigan, and did his residency right down the road in Porstmoth, VA. Known for coining the term “We treat people, not teeth”, his service in the navy prepared him for dire 24 hour emergency scenarios. Doctors: Timothy K. Johnston, D.D.S. Description:This is a local Suffolk dental clinic that tries their hardest to feel as a small town dentist with a tech savvy attitude, they will make you feel immediately at ease and cut down on your fear factor before they see to mending you during an emergency. Dr. Timothy Johnston professes himself to be an absolute “dental nerd”, and that he has opportunities to further his education in his daily life. On his down time, he loves water skiing, car racing, and deep sea diving, and he has built his practice laboriously from the ground up since 1989. Description:This location has been a dentists office since 1962, and is fully equipped to handle any after hours dental emergency you may encounter. Sports, traveling to see relatives, and ocean trips can all offer up unintended dental accidents, and Lovell is here to help you when an emergency strikes. A native or Martinsville, VA, Dr. Eric Lovell received his bachelors from the University Of Virginia, and then his doctorate from VCU, home of the Rams. Motorcycles and running are his favorite pastimes outside of the office, and he loves giving every patient the emergency attention they need while in distress. The city of Suffolk is a metro where you can see site of the old port at Nansemond River, and other great attractions like Planters Peanut Center and the Suffolk Center for Cultural Arts. We would love to be the portal for you to locate a 24 hr dentist Suffolk VA , when a sudden mishap throws your entire itinerary for a painful loop. If you want to further investigate any of these dentists before scheduling, you can visit the Virginia Dental Association .